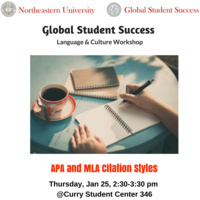 This workshop will focus on how to properly cite sources and ideas and how to avoid plagiarism specifically for APA and MLA styles. This workshop is offered by Global Student Success. RSVP: https://neu.mywconline.net.